A good surround sound-capable sound bar is the perfect solution for those wary of trying to position speakers all over their gaming space. 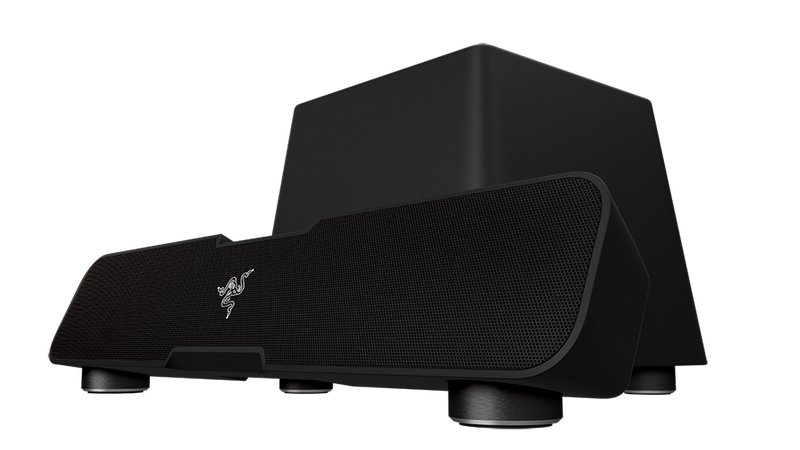 Due for release next month, Razer's Leviathan could be a very good surround sound-capable sound bar. Crafted for virtual 5.1 surround sound gaming and movies or streaming music via Bluetooth 4.0 aptX, the $199.99 Leviathan is a sound bar with a Razer logo right in the middle of it, which is pretty much exactly what one would expect from a Razer sound bar. There's not really much a company can do with the bar format. Maybe give it the odd ridge here and there. Of course, with any sound solution it's nto looks that matter. It's what's inside. Thank goodness Razer provided a picture of that, as well as a list of pertinent features. "The opportunity to produce a precision-engineered surround sound solution for high-performance gaming, movie watching and music listening, and make it versatile to use in any setting, was a very exciting proposition for us," said Min-Liang Tan, Razer co-founder and CEO via official annoucement. "The Razer Leviathan delivers what music aficionados, movie buffs and gamers alike are looking for to improve their entertainment setup." A sound bar with a Razer logo on it! I've been using a sound bar for several years now, having long given up on attempting to run wires across my living room or finding a suitable wireless solution. I just don't have it in me. I am however, quite handy when it comes to placing a single long set of speakers in place. Connecting it to a subwoofer gets a little tricky, but I manage. Therefor I welcome any new entries into the space, especially from a company that's proven its audio engineering acumen time and time again in headset form. There's just no telling with a sound bar until I can hear it, which I'm sure I will eventually. Until then, it looks lovely. Glad they resisted the urge to go green.